Hynoid is a hyena with a humanoid-like body resembling a werewolf. One of the fastest Bakugan, Hynoid ruthlessly tracks down its enemies. Hynoid creates a stunning thunder and lighting attack to destroy opponents. Hynoid is a wolf/fox type bakugan. 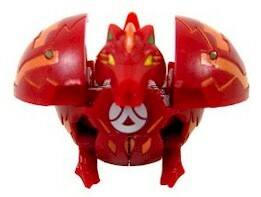 It is a normal powered bakugan, and it is known for it's great speed. A Subterra Hynoid is used by Billy. Runo Misaki has a Haos Hynoid. Purchase Hynoid from Amazon now!